Model: dc00225_br_Width: 20 inches_br_Height: 4.2 inches_br_Color: _span style=""_standard - White_/span__br_Mirrored: No_br_Added Wording: _br__/b__/p__center__h1_Lake Sturgeon Decal_/center__/h1_A living "dinosaur" of the fish world! 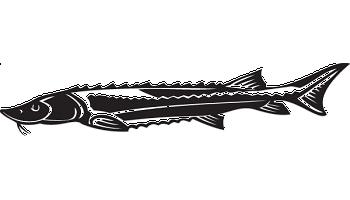 Get your lake sturgeon decal here at decalcity.com!_br_Instead of scales, the sturgeon's large brown or grey body is covered with tough, leather-like tissue and five rows of bony plates. It has a shark-like, upturned tail and a pointed snout._h2_Lake Sturgeon Sticker_/h2_These leathery giants can live up to 100 years!